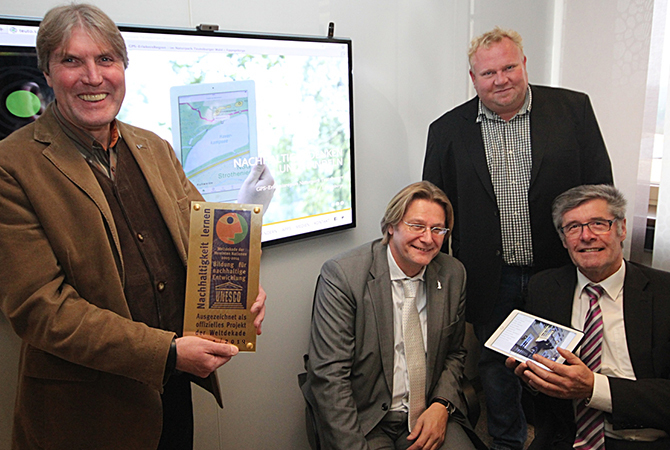 The GPS-Adventure Park in the Teutoburger Forest / Eggegebirge Nature Park, the GPS-trails of the Lippe district, the Nature Trails at the Externsteine monument, the “Exquisite Nature” in the Höxter district as well as the Muscat Geotourism Guide have been awarded (again) as an official project of the UN Decade “Education for Sustainable Development 2005-2014” (ESD). Having been awarded in 2008/2009 and 2011/2012, the GPS Adventure Park concept is receiving this prestigious UNESCO award again, following a successful application by the project partners. “Receiving this award for the third time shows that we are on the right track” says the Head of the Lippe district Friedel Heuwinkel. “Being awarded, again, is a great appreciation and motivation to continue with future innovative features of the project” said Henning Schwarze, project initiator and Managing Partner at INTEWO. The new UN award documents the success and the continued development of the project. In recent months, new applications for the Android and iOS operating systems were published and a new project website had been developed. “With support of innovative applications and with the introduction of new media, we can promote our points if interests and attractions even better” adds Günter Weigel, Executive Board Lippe Tourism & Marketing AG. The United Nations had proclaimed the goal for the ESD Decade “to anchor the principles of sustainable development in all areas of education.” The GPS Adventure Park is using innovative features to motivate in particular a younger audience to learn more about nature and culture.